Virtually every repast onboard Azamara Journey is a treat -- even if it's not the best you've ever had. The food is good (and the bread baskets divine! ), waits for each course are quick and service is friendly and good. Women are served first, and the assistant waiter is always ready with a water or wine refill. Seating in the main dining room is open seating, but once you find servers you like, you can request them each evening. They'll get to know your likes and dislikes pretty quickly;, our waitress of choice knew within two days that my husband liked red wine with a glass of ice on the side. Kudos also go to Azamara for recognizing that many diners have special dietary needs. Every dinner menu, in all venues, feature vegetarian (v), vegan option available (vo), gluten-free (gf) and healthy choice (hc) options; many lunch menus have these as well. At least one of each is always available. Two meals of note you won't want to miss are the once-per-cruise jazz brunch served in the Discoveries main dining room and the Officers' BBQ during which the senior crew lend a helping hand dishing out suckling pig, barbecue ribs, baked beans, macaroni and cheese, make your own Caesar salad and tacos, potato salad and coleslaw. The White Night dinner is another not-to-be-missed meal; served on the Pool Deck, cruisers can pick and choose from nearly a dozen stations serving a variety of cuisine styles. Sodas, select wines and beers are always complimentary at meals. 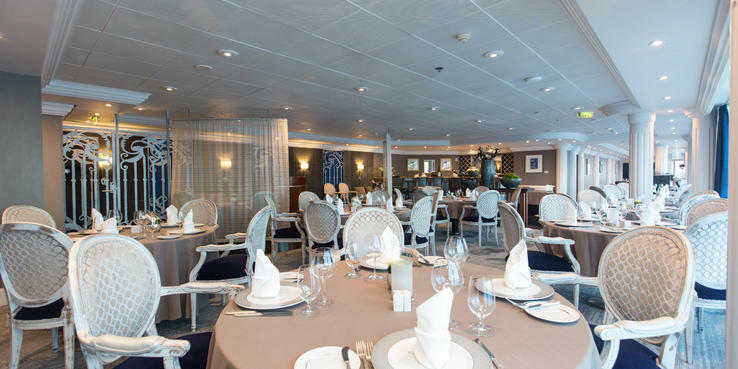 Discoveries Restaurant (Deck 5, aft): You'll find breakfast, dinner and some lunches (on sea days) served in the ship's casual main dining room. Seating for all meals is open; arrive whenever you like during operating hours. Waiting times for a table are generally short, especially for breakfast and lunch. If you arrive during the 7 p.m. to 8 p.m. dinner rush, you might have to wait up to 10 minutes. Tables come in two- to eight-person setups. If you're seated at a two-top you'll be pretty close to the neighboring tables, inviting friendly chats with other cruisers about your day. Several sharing tables are also available each night for those who enjoy dining with new people. For breakfast, cruisers will find standard fare like eggs made to order (including omelets), waffles and pancakes, deli meats, cereal, fruit and pastries. Lunch menus include appetizers, soups and salads, entrees and desserts. Sample items on the lunch menu are rock shrimp with crab cake, nicoise or mixed green salad, Tuscan white bean soup, bacon and egg stir-fry, pasta primavera, barbecue-grilled salmon, turkey club and hamburger. Desserts vary but always include a selection of gelato and sorbet flavors. The four-course dinner menu includes appetizers, soups and salads, entrees and desserts; most selections change daily but there are a handful of always-available options such as Caesar salad with chicken or shrimp, jumbo shrimp cocktail and escargots. Other appetizers choices might include firecracker shrimp or char sui-style chicken with bacon and broccoli roulade, ginger and toasted sesame seeds. Soups and salad sections include, but are not limited to: roasted red bell pepper-corn chowder (v, gf); Louisiana gumbo with smoked chicken, Andouille sausage and okra; fennel and orange salad with arugula and dill (vg, gf); and Tuscany beef broth with cheese tortellini. Entree options might include Tandoori-baked lamb loin with eggplant and spinach roulade, slow-roasted prime rib with horseradish mashed potatoes or baked Norwegian salmon with split pea risotto. Deserts change daily, though Tahitian vanilla creme brulee, New York-style cheesecake and gelato are always on the menu. On top of the regular menu, a World Cuisine selection is available every night that matches the country featured in the buffet that evening. Options might include meatloaf on American night, bangers and mash on British night, a chicken enchilada on Mexican night or coq au vin on French night. Windows Cafe (Deck 9, mid): At the ship's buffet, you'll find breakfast, lunch and dinner, as well as enough tables, so you'll rarely have to wait for a seat. Drinks are served by circulating waiters. Breakfast options include smoothies (with ingredients pre-selected for strength, energy or health, or you can pick your own fruit combination), juice (apple, orange, cranberry) and coffee and tea. Lunch and dinner beverages include sodas, three beers (Becks, Budweiser, Bud Lite) and a small selection of red and white wines. Breakfast options are mostly the same on either side of the buffet, only differing in that the starboard side features a selection of deli meats, while the port side has smoked salmon, mackerel and herring. Items served every day are: scrambled, hard-boiled and fried eggs, as well as omelets made to order; waffles, French toast and pancakes (gluten-free available upon request); and a variety of sausages, baked beans, oven-roasted potatoes, fruit slices, yogurts and cereal and mixed pastries. The lunch buffet typically offers a variety of salads, including DIY ingredients and pre-mixed like potato or cabbage salad. Lunch entrees might include beef lasagna, crispy pork, vegetarian pad Thai, Moroccan-style chicken, steamed veggies, chicken cacciatore, Teriyaki-glazed salmon and a carving station with daily selection of beef, pork or turkey. Fresh fruit, gelato and a selection of tarts, pastries and cakes are available for dessert. Dinner buffets are always themed, usually around a specific style of cuisine (English, Italian, French, Greek and Indian, among others); menus rotate every 12 days. A make-your-own salad bar is always available as well. Dessert selections include one or more sweets specific to the cuisine of the evening, as well as some standard favorites, fresh fruit and gelato. The Patio (Deck 9, mid): The Patio is a poolside grill by day and an alfresco venue by night. It quickly became our favorite place to lunch during the day; the burgers (beef, turkey and veggie) were always juicy and the fries nice and crispy. Other lunch options include beef, lamb and chicken brochettes; buffalo chicken wings, chicken fingers and fried spring rolls; and soups including a chilled option, chicken consomme and chili. Available sides are grilled veggies, French fries, baked potatoes, onion rings and nachos. At night, The Patio converts into an alfresco dining venue with tablecloths and table-side service. The menu consists of grilled fare like beef paillard, bone-in strip loin, BBQ pork ribs, tournedos of lamb tenderloin, grilled curried chicken kebabs and salmon steak with pink peppercorns. Also on the menu is lasagna with creamy tomato sauce. Sides are French fries, baked or mashed potatoes. For dessert, you can choose from a daily selection of pie and cake, as well as fruit salad and cookies. And, of course, the frozen yogurt bar is right next door. Swirl & Top (Deck 9, mid): Right next to The Patio is the 24/7 low-fat yogurt station, with accompanying 15-item toppings bar. (The only thing missing is whipped cream.) The two self-service machines always have vanilla, and will also either have one with chocolate and one with strawberry or both will have the same second flavor. Tapas in The Living Room (Deck 10, forward): From 4:30 p.m. to 8 p.m., a small tapas bar serves up four hot and four cold tapas dishes. A for-fee tapas and wine tasting session is also offered most nights toward the back of the Living Room; reservations are recommended but not required. Mosaic Cafe (Deck 5, mid): Mosaic Cafe is the ship's small, but popular coffee bar. It's not quite a lounge as the groupings of tables and chairs are simply on either side of the space through which passengers walk to get to the shop. Mosaic is stocked with a variety of free and for-fee specialty coffees, as well as an all-day selection of complimentary finger sandwiches and small pastries. Coffees are ranked by intensity level. Room Service: Complimentary room service is available 24/7. Breakfast is only served from 6:30 a.m. to 10 a.m., and is ordered via doorknob cards, which must be hung by 1 a.m. The morning menu includes eight breakfast combinations, as well as made-to-order eggs, steak, griddle choices, cereal, fruit and baked goods. Lunch and dinner menu items are identical and include beef consomme, Caesar or spinach caprese salads, club and seafood club sandwiches, Mediterranean or chips and salsa platters, three types of pizza, strip steak, grilled chicken tenders, oven-baked Norwegian salmon and pasta Bolognese. During dinner hours, you can also order off the main dining room menu. Aqualina Restaurant (Deck 10, aft); $30: One of Azamara Journey's two specialty restaurants, Aqualina serves a delicious, traditional four-course Italian dinner: antipasti, soup and salad, secondi and dessert. Antipastis include beef Carpaccio, seared tuna wrapped in veal, tuna tartare and tomatoes with buffalo mozzarella. The soups and salads include minestrone, lobster bisque tomato, onion and farmer's cheese, and a watermelon, tomato and basil salad. Entrees include mushroom risotto with duck confit, grilled garlic shrimp, eggplant roulade and sole with tomato risotto, among other options. For desert, we recommend the flourless chocolate torte, the limoncello souffle and the tiramisu. As with the rest of the restaurants onboard Azamara Journey, the dress code at Aqualina is casual; only jeans, shorts and bathing suit tops are unacceptable. Open for dinner; reservations are recommended but not required. Prime C Restaurant (Deck 10, aft); $30: The ship's steakhouse, the second of Journey's specialty restaurants, is paradise for meat lovers, with everything from lamb and veal to five cuts of steak, all cooked to specification. Diners generally put their meals here in the top 5 steakhouse dinners they've had. Even vegetarians can enjoy a good meal with a tasty vegetable enchilada on the entree menu and a large selection of sides -- including delicious creamed spinach. The four-course meal includes a starter, soup or salad, entree and dessert, as well as an unlimited number of sides. Menu items include (but are not limited to): tuna tartare with popcorn shrimp, roasted beet and arugula salad, herb-coated rack of lamb, T-bone and ribeye steak, veal tenderloin, filet mignon, Cajun-spiced grilled swordfish, vegetable enchilada and chateaubriand for two. Sides include potato hash, zucchini pancakes, creamed spinach, sauteed or steamed vegetables, Belgian endives with ham and cheese as well as steak fries. Open for dinner; reservations are highly recommended. Chef's Table; $95: Usually held in the front area of Prime C, the Chef's Table dinner is offered several times per cruise, with a rotating menu (there are three in total) and accompanying wines. The five-course French menu includes tuna tartare nicoise, smoked potato leek soup, scallops, filet of beef or seared sea bass and crunchy apple and pear fusion for dessert. On the Italy menu you'll find chilled crab panzanella salad, celery and turnip soup, house-made black pepper tagliatelle, roasted veal tenderloin or olive oil poached halibut and chocolate amaretto panna cotta. The third menu, California, features lobster and avocado salad, smoked tomato veloute soup, surf and turf, herb-roasted prime Angus New York strip loin or potato-crusted sea bass and macadamia nut chocolate mud pie. Chef's Table is always hosted by either a senior officer or one of the ship's guest speakers. Reservations are required and can be made at the guest services desk or through the concierge.